Sunburst® Gourmet Blends are our premium, fortified, natural small animal foods formulated as a food and treat all in one. 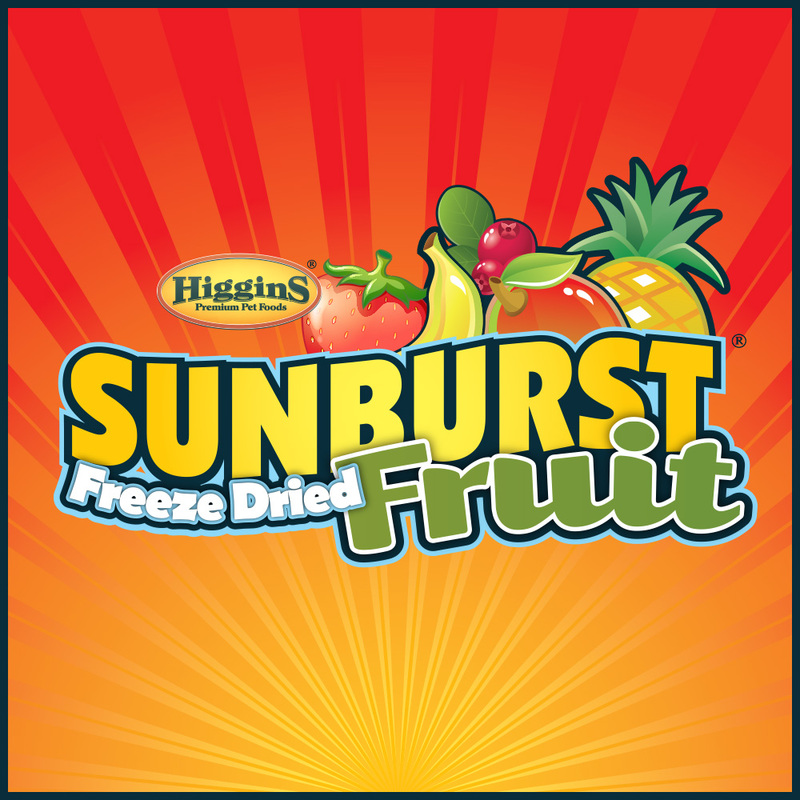 Sunburst® contains mixed fruits, sun-cured hays, vegetables, legumes and much more! What you won’t find in Sunburst® are artificial flavors, preservatives and chemical colors. Instead, Sunburst® uses colors sourced from grasses, herbs and vegetables. Sunburst® is enriched with plant-based DHA omega-3 fatty acids as well as protected probiotics to support immunity. Fiber is a key component of your pet’s diet, but not all fiber sources are equally good for your pet. Some fiber can actually contribute to gastrointestinal problems. Higgins Vita Garden® is made with our proprietary Fiber-Biotic® pellets that are scientifically formulated with a multi-fiber, nutritionally balanced approach for your pet’s optimal health. Fiber-Biotic® pellets are gluten free and blend multiple, natural fiber sources beneficial to herbivores to support overall health, digestion and firmer stools. Vita Garden® contains Hemicellulose Extract, a natural soluble fiber that is also a prebiotic source to support nutrient absorption and the immune system. Vita Garden® is also enriched with protected probiotics and plant-based DHA omega-3 fatty acids to support immunity. Supreme Small Animal Mix is an economic, base diet formulated for large scale breeders and retailers feeding multiple small animals. Supreme Small Animal Mix is intended for omnivores like hamsters, gerbils and other rodents. Sunburst® Gourmet Natural Treats for small animals are an assortment of fun, healthy, natural snack mixes that supplement your pet’s regular diet. Sunburst® Gourmet Natural Treats are also free of artificial colors and preservatives. Available in flavors for herbivores and omnivores. Higgins Sunburst® Gourmet Treat Sticks, with added vitamins and minerals, are the treats with more natural goodies your pet small animal craves. Sunburst® Gourmet Treat Sticks are free of artificial colors and preservatives and are an entertaining, delicious treat for your furry friend. Sunburst® Freeze Dried Fruits are an assortment of all natural, whole-food, fun treats that companion small animals enjoy. These healthy treats are free of added sugars, sulfites, preservatives, gluten and GMOs. Fruits are harvested and freeze dried at optimal ripeness to capture the best, natural flavors. Great for all small animal herbivores and omnivores including Mice, Rats, Hamsters, Gerbils, Sugar Gliders, Rabbits, Guinea Pigs and Chinchillas! Sunburst Break-A-Bale® Hays are unique, easy-to-feed, less mess alternative to loose hay. Sunburst Break-A-Bale® Hays are compressed into four pre-cut portions per package. Just cut along the dotted line on the package, “break off” one of the pre-cut feeding portions and place in your pet’s cage. It’s that easy! It’s less mess and portion guessing for you and more foraging activity for your furry pet than loose hays. Each portion lasts an average of 2-3 days, depending on the pet. Sunburst Break-A-Bale® compressed hays encourage foraging, which promotes better dental health and overall well-being. Our Western Canadian grasses and hays are sun-dried, sorted and free of pesticides, preservatives and GMOs.